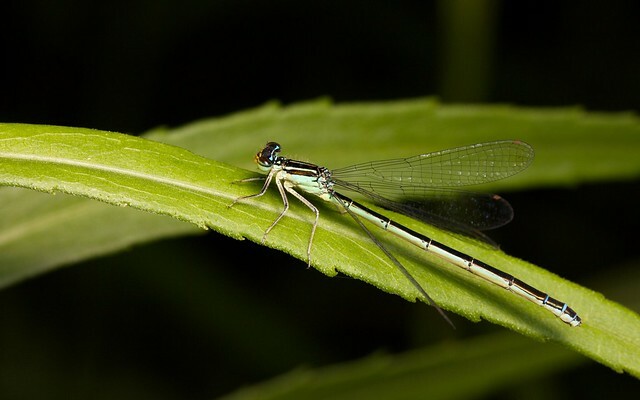 A damselfly eating a moth is like a toddler eating spaghetti. They just can't do it cleanly, or maybe they don't care to. Female Rainbow Bluets aren't quite as colorful as the males, but they're exceptionally handsome damselflies, with pale green underneath and almost solid black above. 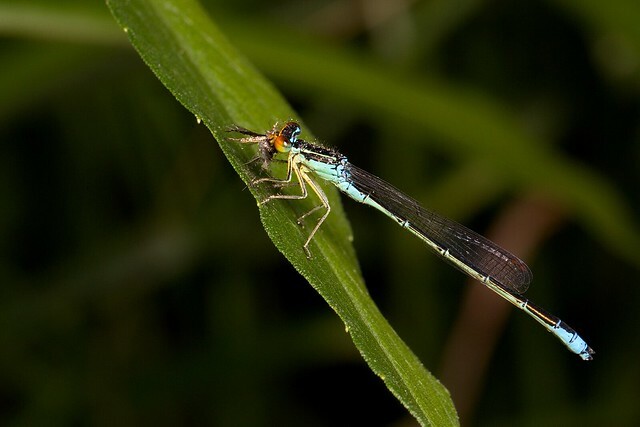 The Rainbow Bluet is one of my favorite Odonates -- a damselfly colored like a tropical bird. 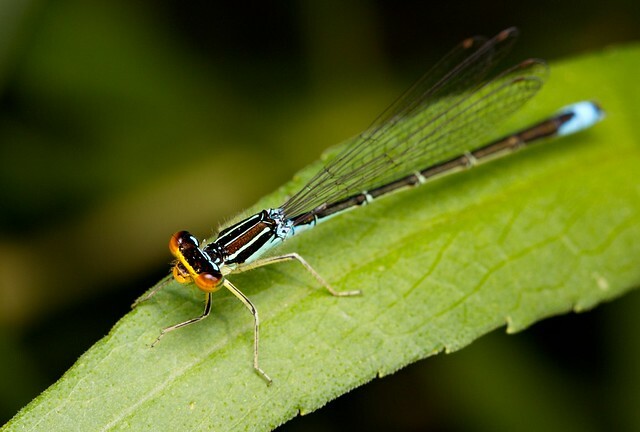 The most reliable place I know to find them is Lake Louise State Park, near the Iowa border, where they coexist with Orange Bluets and purple Variable Dancers. The fact that all this color occurs in Minnesota seems like some kind of mistake. 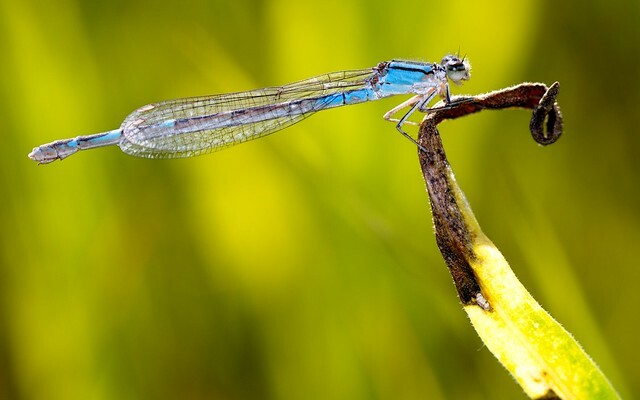 Most Bluet damselflies are blue and black and hard to tell apart -- in some cases it takes a microscope. Orange Bluets start out with the same color scheme, but turn a beautiful bright orange at maturity. Females sometimes remain blue, but more often become green or yellow; the one in this mating wheel is in mid-transition. This species is also known as the Variable Dancer because southern individuals have brown or black wings. 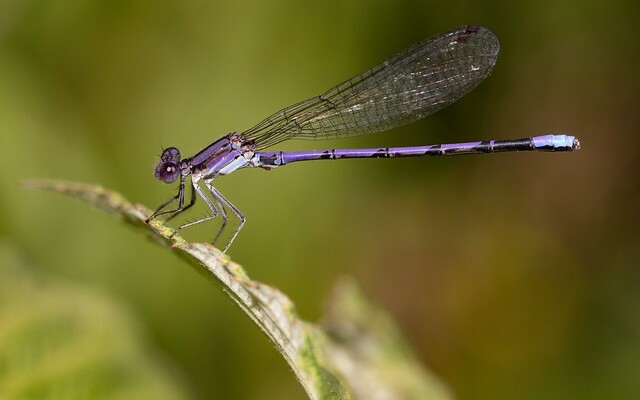 In Minnesota we have only the clear-winged subspecies, Argia fumipennis violacea. 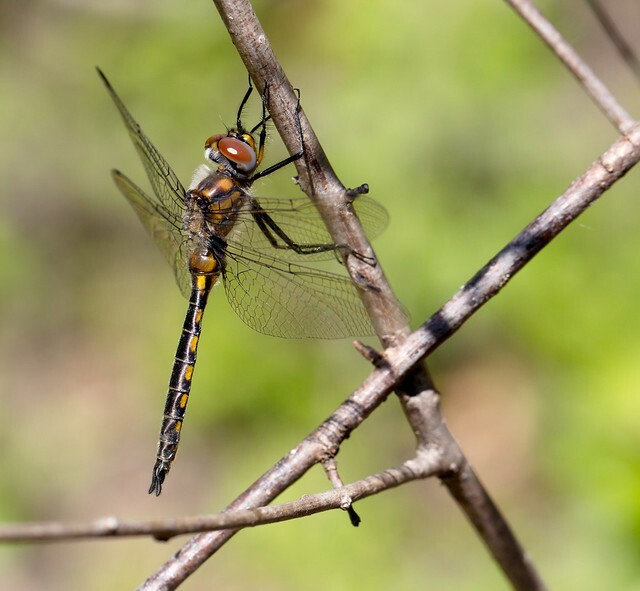 I saw my first non-migrant dragonflies of the year on May 10th at Murphy-Hanrehan Park Reserve. This is early, though not quite as early as the warm spring had led me to hope. Emergence may only be a week or so ahead of schedule. I only saw one of these Spiny Baskettails, but luckily he perched long enough for me to get this photo. I love watching bluets glean insects from plants. They hover around, inspecting the stems with an air of polite interest, often flying sideways while rotating so they always face the target. Now and then one will stab forward in the air -- like one of those poles used to spear trash in parks -- and grab what it thinks is a bug, but may actually just be just a piece of debris, or the scar left behind by a fallen leaf. Then they move on, unembarrassed. When they do get something to eat, it's often a tiny fly you can barely see, but this Tule Bluet managed to pick up a more substantial meal. 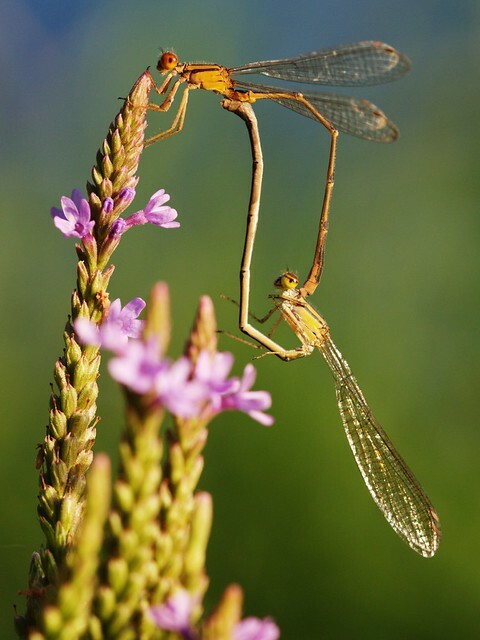 I knew I was in luck when these mating Orange Bluets landed on a vervain spike. 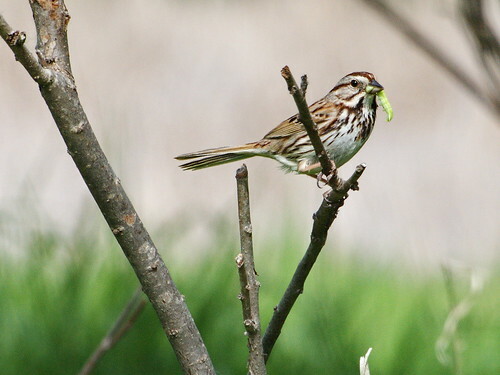 pameladean pointed out this Song Sparrow hopping around in a stand of sumac. Looking at it in the viewfinder, I thought it had a piece of nesting material in its beak. When I zoomed in on one of the photos I'd taken on the camera's LCD screen, the "nesting material" turned out to be a Dusky Clubtail dragonfly, minus wings. I doubt a sparrow could catch a dragonfly out of the air, so it had probably found a recently-emerged one in the grass. Those photos didn't come out very well because the spotted brown dragonfly was hard to make out against the spotted brown sparrow. Luckily, the bird's next catch was a green caterpillar, which shows up much better. I suppose the bugs were destined to be baby food.